In this overview of the Rokinon 85MM Cine Lens 85MM, we'll cover why it's a great choice for filmmakers and videographers, especially if you're on a budget. This prime lens is definitely worth a consideration for your glass collection. It will certainly improve your videography game, and would work well with any DSLR camera. Prime lenses are priced for someone with a big budget. However, aspiring cinematographers and independent filmmakers can rejoice because an affordable line of cinema lenses has been introduced courtesy of Rokinon. These things are up to 14 times less expensive than their Canon equivalents but just because they're 14 times less expensive does that mean they're 14 times worse? A Cine lens is designed specifically with the Digital Videographers and/or Cinematographer in mind. The lenses have gears that protrude out of the sides of the lens (see image above), allow for external accessories like follow focus devices or aperture control devices that help you. The videographer can maintain focus on a moving subject and adjust changing light within a scene with nice smooth dials that connect to your lens. Now if you're serious about your videography, you're going to want to at some point consider a Cine lens but buyer beware, these things are not cheap! Let me give you an example, the Canon cinema 85 millimeter t/1.3 will set you back, are you sitting down, $4,950! Combine that with the cost of follow focus gears and base plate; frankly videography can very quickly set you back tens of thousands of dollars. Let me give you an example, the Canon Canon cinema 85 millimeter t/1.3 will set you back, are you sitting down... $5,530! Combine that with the cost of follow focus gears and base plate, and your videography can very quickly set you back tens of thousands of dollars. From a recent shoot - 85mm will up your bokeh game! It's a much better grade of quality that you would expect for something that's so relatively inexpensive. Plastic is not cheap. It's actually pretty solid. It's got a nice focus ring, an aperture ring which are extremely smooth. Lens to hood on the flip side is really cheap. It doesn't really snap into place, and you can just really just take it off with hardly any pressure at all. It's made of low grade plastic -- very much unlike the lens itself -- but it's functional. It serves the purpose well, which is take close up pictures. Or get your bokeh game going. Is the Rokinon 85MM the Best Option for Cinematography? Simply put in the brave new world of cinematography, the value of the Rokinon is nothing short of extraordinary. No -- there are no electronic components. No -- the lens is not optically perfect nor does it need to be. As you know, optics means slightly less in motion, pictures they do in stills but at the end of the day this lens is not quite up to the part of the Canon but you have to consider that this lens is only about one fourteenth the price of the Canon, meaning that you get about 80% of the lens for about 8% of the cost. So the bottom line is for value, this thing is nothing short of extraordinary and easily a 5 stars out of five. Or 10 out of 10. Or whatever metric you use, this lens at this price point cannot be beat. How to Use the Rokinon 85MM Lens to Improve Your Wedding Videography? For wedding videography, we do recommend zoom lenses as that will allow you to close-up shots. However, as I said, when you use a prime lens you do get better quality images. And quality images mean happier clients which means more referrals and money in your pocket. If you can have multiple shooters at your wedding videography gig, one of the things I like to do is give one of the secondary shooters a Rokinon 85MM and the other shooter an 18-35MM Zoom lens. The videographer with the 18-35MM zoom lens can focus on taking more wide angle shots, and the other can focus on getting close-up shots. Finally, I usually set up another camera with either a 35MM or 50MM prime to shoot the entire ceremony or banquet hall. I've found that this setup allows me maximum coverage, if my budget allows it. I admit that the 85MM lens is more of a luxury than a necessity. Read our main article of videography lenses on what we think you should buy if you're just starting out. Finally, if you intend to shoot films, an 85MM must definitely be part of your collection. After watching that sequence, imagine if it was taken on a 50MM. Would you have a different feel? Of course! It would be less jarring than how Aronofsky shot it. One of his signature styles is the use of the Extreme close up (ECU) replaced with a wide angle, which creates a sense of being alone in the world. Filmmaking is an art form and you can't shoot everything on a 50MM. You'll need to vary between wide angle and the macro view to keep your audience interested. At around the 3:50ish mark, youll see that the cinematographer uses a 35MM. In the wide angle version, you can make out the background and see the actors. The Coen brothers love to shoot in this style. The background becomes a sort of mise-en-scène so you can see the characters in relation to the world around them. Now compare that to shots taken at around the 6 minute mark. He uses a 100MM to focus more on the actors. Now, these shots have more bokeh and the focus is on the girl's face. Personally, I love the Coen style of dialogue but that is outside the scope of this review. The important take-away is that a serious filmmaker requires a macro lens in their kit. There are many times where a close up of the actors's faces and reactions are more important, and you need the audience to focus less on the background. In these situations, you'll need a macro lens like the Rokinon 85MM Cine. Is Rokinon Worth the Price? If you're a wedding or event videographer, there's definitely a place for your kit for cine lenses. 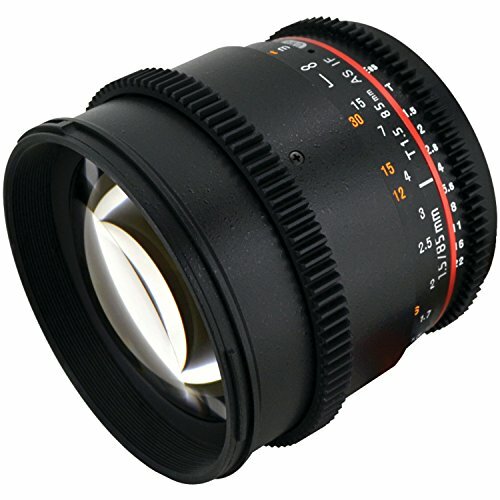 A great entry point would be to get the Rokinon's 85MM Cine Lens. This will allow you to take high quality close up pictures and a lens you can give to your second or third shooter for coverage. We give 4 stars out of 5. It's great value for the price, and I know a lot of indie videographers use it as a go-to lens for their commercial stuff. It's not a perfect 5 because it's still not a prime Zeiss lens (but then again that's more higher end). For filmmakers, a macro lens is a MUST. As detailed above, shooting dialogue on a wide angle lens versus a macro lens has a different feel. Since filmmaking is all about creating the tone (and lighting! ), then you'll need the right lens for particular shots. Not everyone can start off with the Canon or Zeiss lenses so Rokinon's Cine lenses are a great alternative for student or beginner filmmakers. Thank you for reading this review on the Rokinon 85MM Cine lens. Definitely check out our lens guide for DSLR cameras for more info or go back to Part 1 of our film guide.